Cloud is practicing his aim, accuracy and shooting in the shooting gallery. Cloud is hanging up posters about his revolution that he's planning against the Solar & Lunar Empires. He doesn't know how he's going to revolt against both, the Lunar & Solar Empires. He then walks away from his poster that he just posted up. He sighs as he hopes for some recruits. "I hope I can get some recruits, to revolt against both, the Lunar & Solar Empires before it's too late." Cloud says as he starts to fly away. *Cloud has just fallen from the Canterlot Castle with a wound, he fell off the top of the castle from a wound that was caused by a gun, Cloud was bleeding* I need a medic or a doctor. 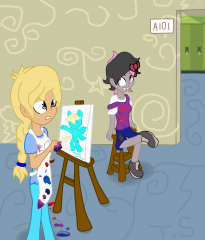 She was just trying to paint Solar! What happened! TOUGHSPIRIT!!!!!!!!!!!!!!!!!!!!!!!!! 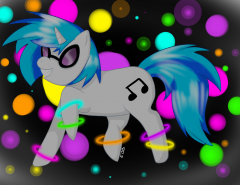 Contest entry for Hoofsplatter and Solarsound. So, this is something I just decided to do on a whim. My roleplay character, Honeydew, is a reporter/journalist for a Manehattan tabloid I've decided to call The Daily Turnip. It just seemed like a fun idea to actually write some of what the articles in this tabloid look like. I think the format of the blog will go something like this: Maybe a few sample headlines for that day's newspaper. A Did You Know? tidbit involving a conspiracy theory. Honeydew's article for that day. And a horoscope section (OF COURSE!)... 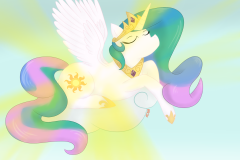 Of course, since this is Equestria, I'm thinking that the horoscopes would be something different. So, here's a reference guide: Aries (March 21-April 20) = Jackalope Taurus (April 21-May 21)= Ursa Gemini (May 22-June 21)= Hydra Cancer (June 22-July 22)= Spider Leo (July 23-August 21)= Manticore Virgo (August 22-September 23)= The Mare Libra (September 24-October 23)= Balance of Harmony Scorpio (October 24-November 22)= Cockatrice Sagitarrius (November 23-December 22)= Arrow Capricorn (December 23-January 20)= Chupacabra Aquarius (January 21-February 19)= Cloud Pisces (February 20-March 20)= Guppy In addition, I might have some of the articles associated with episodes from the series (I will put this in the tags, so be on the look out for that). Feel free to comment. If you'd like you can comment in-character as a pony reading one of the articles and reacting accordingly. If you're going to comment out-of-character, please put it in [brackets] or (parenthesis). New thoughts on the film. Leif was setting up her fliers for her very first show!She hung them up everywhere,in the halls of schools,in parks,on benches,everywhere!She was trotting down to the heart of Ponyville when the wind kicked and made her saddle bags go flying[colour=#006400],"Oh no! "[/colour]She started to fly towards them but the wind smacked her and she went flying to the ground,her saddle bags still flying[colour=#006400]."Help,please... "[/colour]She said quietly. Temp Zero was the new pony in ponyville, he had just moved here today,he didn't know where to go or hat to do at the time. He asked around for help, or at least tried to, but no one answered him. "Will any pony please help me?!" He yelled aloud wondering if anypony would stop to fill him in. Legends of Equestria Alpha is live! 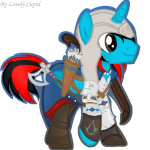 Conor Colton here with a very special announcement regarding a certain online MMO MLP game Legends of Equestria is live in Alpha! I really hope this doesn't put too much stress on their servers but... http://www.legendsofequestria.com/ Go! Enjoy! It was the start of another day at the Equestria Orphanage, a large complex of buildings outside of Ponyville. The Orphanage houses a number of orphaned foals and younger ponies, giving them all a loving, caring home. The founder and guiding force of the orphanage is a hard working mare named Phoebe Piccafilly, affectionately known as "Nanny" to the young fillies and colts who live there: She oversees a large staff made up of mostly volunteers who come from all over Equestria to give their time and talents to help out with the care and education of the orphans under her supervision. Today, Piccafilly awaits the arrival of more volunteers as well as a few more orphan foals she heard are coming her way. "I hope they get here soon," Piccafilly said as the unicorn mare began pacing back and forth. "Julibee sent word that she's bringing three newly orphaned foals from Fillydelphia over this morning, I wonder how she will do this?" Glancing through a telescope at the road below, the red maned mare spotted a cart in the distance being pulled by two Pegasus ponies with a unicorn seated in the back. The petite white furred blonde mare and the elderly lime green stallion pulling the cart are Jubilee Flyer and Professor Clyde Krashkop respectively. In the cart with the foals is a lanky periwinkle colored unicorn with a stethoscope on her neck is Nurse Starflower. "Jubilee! Professor! Starflower! Good to see you all!" Piccafilly said as members of her staff rushed over to receive the foals from off the cart. "We came as soon as we could," Jubilee said as she unhitched herself, "glad to help out!" "Thank Celestia for your orphanage, Miss Piccafilly," Starflower said, using her levitation magic to float the baby foals down to the waiting staff members. "I already gave these three foals a preliminary examination, but Doctor Stable will be dropping by to have a look at them when he does the weekly clinic checkups on the rest of the orphans." "Und I am ready to teach in dee classroom today," Professor Krashkop said as he unhitched himself. "I vill talk to dem of elementary science!" "Oh yes, I heard about that, Professor, thank you. thank you all! Please come in for some light refreshments. I am hoping more volunteers will be coming today," Piccafilly said as she looked out upon the road to see if anypony else was coming. The rad sensor's counters were tipping off. The little hoofheld device's lights flared up, indicating warnings of extreme rad exposure for the next few hundred meters. Rad poisoning wasn't a pleasant experience and Keen didn't want to take any chances. She had experienced the pain and suffering it had caused firsthoof. She pointed the device into another direction and it gave the all clear. Sighing, she placed her rad sensor back into her saddlebag and began to trot into the new direction. A few fires were visible ahead. They weren't natural but somepony had lit them as it was lighted in metal barrels filled with wood and other debris. Perhaps somepony was here to light the way or just to keep warm. She cursed herself for not agreeing to buy the used pipbuck that one of the Earth Pony merchants found along the way. It would have proven useful in detecting life signs and movement in the ruins. The use of an "eyes forward sparkle" would have been helpful. Still, she had to make do with what she had. Her experience has taught her that this might be a trap setup by raiders. She cautiously moved along the rubble, silently trotting from cover to cover. From time to time she would stop and observe the surroundings. She had unbuttoned her shotgun's saddle holster in the event that things would get dirty. "CLANK!" A loud sound came from the ruined building to her left just a few meters away. In an instant, her horn flared light blue and the shotgun was blanketed in her magic as she levitated it in front of her, cocking it, ready to shoot. Her heart began to beat fast as her instincts for survival kicked in. She was expecting a raider to get the jump on her but the movement ceased. She moved in closer with the shotgun still levitating slightly in front of her and made her way to the rubble. Her eyes were wide expecting something or somepony to come out from it. "Hello? Anypony there?" She nervously asked. "Come out where I can see you. I won't hurt you if you won't hurt me." No answer. It was silent. Too silent for comfort. Still not satisfied, she moved around the rubble. Maybe somepony was stuck under it, or maybe this was just another trap setup by the raiders. Seeing that nothing was amiss, she let her guard down and levitated the shotgun back into her saddle holster. She gave out a sigh of relief. "SQUEEEK!" A huge rat jumped right out in front of her and ran across the street into another pile of rubble. She jumped and almost screamed at the surprise. When she realized it was one of those rad infected rats, she was relived and giggled to herself. She was amazed at how some creatures could still survive in this harsh environment It was getting dark and she had enough adventure for one day. She had no other reason to stay out here any longer now that she had found what her client was looking for. A rare and unopened bottle of Strawberry-flavored Sparke Cola. Apparently, her client was a collector and this was the last rare flavor that needed to be on the collection. She was tempted herself to open it as it sounded delicious, but then her client wouldn't be too happy. Tenpony Tower was a few minutes away, but she wasted no time to get there. The Tenpony Tower monorail station on the Celestia Line was the only way to get into the tower via its exit/entrance into the building. She had to get up into the line and make a mad dash into the building's entrance. She knew it was particularly safe at this time of day but she didn't want to take any chances of being caught by one of those Bloodwings that constantly flew the skies around the ruins. As she reached the gate, the guards greeted her and smiled. "So Ms. Keen, what trinket have you brought in today?" Asked a guard. "Oh its nothing much, just this rare bottle of Strawberry flavored Sparkle Cola." She said as she levitated the bottle out of her saddlebag showing it to the guard. "By Luna's mane, I just don't get why some ponies ask you to get such... useless things." "I don't know either but they paid a lot of bottlecaps for this." She levitated the bottle back into her saddlebag as the guards opened the gate. She was glad to be back home, and made her way to one of the working elevators and punched her floor. Her client wasn't due to come back in a few hours so she thought she'd have a nice long bath. She'd been out for almost half a day and all she wanted was food, bed and bottlecaps. She was feeling a bit nauseous though and figured that she suffered a bit of rad poisoning. She made a mental note to visit Dr. Helpinghoof to pick up some radaway later. One happy day in Equestria, Trollface popped up, Trollface thought. "The physics here are lame, lets update them" | He then held a flashlight behind his back and ran at the speed of light. So begins Trollfaces adventure in Equestria.